Are you suffering from unbearable pain in your shoulder? Are you unable to move your head normally? Sometime this kind of pain occurs due to bad sleeping posture and such pain will go away automatically in a couple of days. If the pain goes in a day or two then it’s perfectly fine, but if it is continuing for long, then it is better to not ignore the shoulder pain for long. Because what you are assuming to be a normal shoulder pain due to bad sleeping posture may actually be due to frozen shoulder. Frozen shoulder also known as “adhesive capsulitis” is a condition where an individual suffers from ongoing pain and stiffness in the shoulder which may continue for several weeks, months or even years (depending on the severity and the kind of treatment you have adopted for). There are medical treatments available for frozen shoulder, but in most cases, frozen shoulder can be treated at home with simple remedies. And if you are wondering about how to treat frozen shoulder fast and easily at home, then here’s the post worth checking. In today’s post, I will be talking extensively on frozen shoulder today and will also discuss various ways to treat frozen shoulder easily at home. The shoulder joint has a loose joint capsule called the articular capsule of the humerus and the connection issue often gets inflamed and stiff. The problem of frozen shoulder worsens when the inflammation increases due to immobility of the shoulder or due to problems in normally flexing or stretching the shoulder. Freezing stage– in freezing stage, you generally experience a pain in your shoulder when you move it. Slowly the pain increases mostly during the night. Your shoulder movements become very restricted in freezing stage. This stage can last for up to 6 or 9 months. Frozen stage– Here, there may be improvement as far as the pain in the shoulder is concerned but if you consider the stiffness factor then it actually worsens. You will find it too hard to move the shoulder and hence there will be lot of problems doing your daily activities. Frozen stage may last for 4 to 12 months. Thawing stage– This is when you slowly recover. You will be able to move your shoulders better than before but the full recovery process may take a span of 6 months to as long as 2 years in some cases. The number of frozen shoulder cases is increasing on a steady pace with the American Academy of Orthopedic Surgeons estimating around 2 to 5% of the adult population suffering from this health concern at any given time. So what are the main causes of frozen shoulder? Now, that you have a fair idea of the causes of frozen shoulder, it is important that you note down all of the symptoms as well. Knowing the symptoms helps you to identify the condition of frozen shoulder early. And if you can identify it early, you will be able to start the treatment before the situation worsens any further. Listed below are the most common symptoms to identify frozen shoulder easily. Too much stiffness and pain in the shoulder. Please note that it occurs only in one shoulder and usually returns to the same shoulder as well. However, you must be aware in case you experience any such symptom in your other shoulder as well because as per American Physical Therapy Association, if you have suffered from a frozen shoulder once, there is about 20-30% chance that you may develop the problem in your other shoulder. You will experience joint, muscle and bone pain in and around your shoulder. The pain in many cases increases during nighttime. Your range of motion will be limited. In other words, your movement of your shoulder will be very much restricted. Lot of difficulties in doing simple daily activities like getting dressed, reaching on to something, carrying things, sleeping normally, holding objects, driving etc. Hopefully, by now, you have noted down the causes and the various symptoms of frozen shoulder and so, now, it is time we learn more about how to treat frozen shoulder naturally. Hence, let us start with the discussion without further delay. When there is too much of a pain, then doctors often recommend taking the help of steroids, painkillers or other numbing medicines. But, as you know taking all of these medicines is not good for your health in the long run. These may give you quick relief but in most cases the relief is temporary. You need to think of remedies that are safe for your health in general and help you treat frozen shoulder fast and easily at home. And, thankfully, there are natural remedies and practices that can help you in treating frozen shoulder naturally. The process of recovery may be gradual, but it helps you to recover completely from the frozen shoulder and that is very important. Listed below are some of the easiest remedies to treat frozen shoulder fast and naturally. Take a look and use it your advantage. Heating and stretching is one of the most effective practice that can help you treat frozen shoulder fast and give quick relief from the pain. It, in fact, is the first step that you need to take before you take up the other ways (mainly the shoulder exercises). Basically, it is said that you got to warm up your shoulder before you start with the shoulder exercises. Heating increases the blood supply in the portion which is affected which in turn, reduces the chances of having an injury. You can get it done by taking a warm shower which includes having an Epsom salt bath as well. Then you may consider applying heat on your shoulder for about 15-20 minutes by using the commercial heating pad or by making your own heat pack. Also, you can rotate your shoulder very gently in small circular motions but do it only if you are able to do it comfortably and without abnormal pain. When you are stretching your shoulder, then you will have to focus on the slight tension and the soreness. But you must be very careful not to overstretch or do it in a hurry. You can do the judgement by paying attention to the soreness when you complete stretching. Try to keep the muscles loose and relaxed so that the stretch is applied to the soft tissues and not the hard and tensed ones. Your aim should be to gently bring more flexibility and motion to your affected shoulder and so it is best to do some stretching 2-3 times on a regular basis. Listed below are a few of the simplest shoulder stretches that you may like to practice. Lie down or simply sit and lift the arm straight above you. Open and close a door or cabinet. This will help to rotate the arm externally. Lie down and make a shape of “T” using your arms. You need to just bring them outward and to the floor. Exercise is certainly the best way to get rid of frozen shoulder and improve your condition and researchers at Harvard Medical School have already recommended certain exercises for you. Listed below are a few of the best exercises which can be very effective in treating frozen shoulder. Here you stand up and keep your shoulders relaxed. Now, let your affected arm hang down. Swing your arm in a circular manner for about 10 times in each direction. Make sure that you take small circles. Do this at least once regularly at the beginning and then decrease it when you notice stiffness. Slowly, you can add repetitions or do more sets regularly. With time, when you gain confidence, you may also do pendulum stretch taking some weight like around 3 to 5-pound dumbbell in your hand. Also, you may increase the diameter of the swing of your arm. This helps in opening your shoulder more. Take a 3 feet long towel and use your hands to hold each of its side. Now bring it behind your back and then try to grab the opposite end with your other hand. After that, try to pull the top arm in upward direction in order to stretch your shoulders and at the same time, you need to pull your other arm downwards. If you do this 10-20 times on a regular basis, then I am sure you will experience quick improvements. In this exercise, you need to stand facing the wall keeping your fingertips on it at the waist level. Make sure that your arms are bent slightly. Now, walk your fingers slowly up the wall and try to lengthen the arms upward as much as you can get it done comfortably. Repeat it 10-20 times regularly for maximum benefits. In cross-body reach, you got to use the unaffected arm to lift the affected one at the elbow. Bring it up and across your body in order to hold a stretch in the entire arm for about 15-20 seconds. Do this 10-20 times daily. However, when your mobility will slowly increase, try to work on reaching further across your body. Place your affected hand onto a shelf which is about breast high (You may consider a counter top for practicing). Now, bend slightly and straighten your knees in order to open up your armpit. Basically, you need to come into a squat and bend a bit deeper each time. Do it 20 times daily for maximum benefits. Here, you need to warm up or stretch your affected arm at the beginning. In case of outward rotation and strength, you got to hold a rubber exercise band in between your hands and then rotate the lower portion of the affected arm 15-20 times in outward direction. In case of inward rotation, hook one end of the band around a doorknob and then pull the band 15-20 times towards your body. However, please note that these exercises actually require added resistance and so it is recommended that you do these only when your pain is reducing and your mobility is improving. You are in all probability going to get relief after you diligently perform the above-mentioned exercises. But if you still have frozen shoulder pain and you are experiencing difficulty moving your shoulder freely, then you may take the help of a physical therapist or physiotherapist. This is because they generally know specific stretches and exercises that helps in improving the range of motion, flexibility and the strength in your shoulder. You can tell him/her to come home for the therapy and I believe that if you continue it for 4-12 weeks, you will get good results. You can also consider taking the help of acupuncture in order to get some relief from your frozen shoulder. It provides instant relief to individuals with severe frozen shoulder and studies are a proof to that. The best thing is that acupuncture has no side effects or harmful long terms consequence so it can easily be considered as one of the safest ways to deal with the problem of frozen shoulder. To get maximum benefits in treating frozen shoulder, you can take up acupuncture besides undergoing your conventional therapies. The deficiency of magnesium is associated with the occurrence of frozen shoulder and hence inclusion of magnesium in your diet is one of the best ways to treat frozen shoulder fast and naturally. Low levels of magnesium actually increase the risk of inflammation and so it is associated with having higher chances of getting affected by frozen shoulder. While on the other hand, when your body has magnesium in proper amounts, it actually helps in the prevention of calcification of blood vessels and also improves the flow of blood through your system. And, the best thing is with dietary magnesium; your body will absorb as much minerals as required by your body. So, please eat magnesium rich foods like boiled spinach, mackerel, almonds, cashew nuts, pumpkin seeds, avocado, broccoli, eggs etc. in adequate quantities. Besides eating magnesium rich foods, you also need to concentrate on the other food items that you are eating and help improve your gut health. Now, if you are suffering from frozen shoulder, you must eat foods that are anti-inflammatory in nature. Eating fresh fruits and vegetables with anti-inflammatory properties can be highly beneficial in getting rid of frozen shoulder. Also, the probiotic rich foods like yogurt are considered to be very beneficial. This is because of the presence of the good bacteria that is very beneficial for your overall wellbeing. You can also consider taking anti-inflammatory supplements like for example omega 3 fats, turmeric, CoQ10 etc. 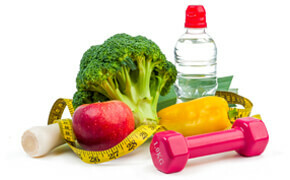 However, it is advisable that you consult a doctor before taking these supplements. It is obvious if you want to heal your frozen shoulder fast, you will have to avoid factors that lead to inflammation. Instead of using the medicines and drugs, you may also take the help of peppermint oil in order to ease the frozen shoulder pain. This is because peppermint oil has the ability to numb your pain. It actually helps in boosting proper circulation of blood that in turn, results in effective reduction of the pain in frozen should. So, peppermint oil is one of the ways to treat frozen shoulder naturally. Which remedies have worked for you in treating frozen shoulder? The experience of having a frozen shoulder is not at all pleasant. After all, who want constant pain in the shoulder? The pain is so tarrying that it becomes literally hard to move your shoulder, hands and neck. Our hands are of primary importance, we use it in doing so much of day to day work. And if we are unable to use them properly, it is going to be very frustrating and painful. Basically, you can say that the frozen shoulder symptom is a great hindrance in your normal lifestyle. And, the worst thing is the problem can stay for several weeks and even months which is a thing to worry for sure. As soon as you feel that the symptoms of your shoulder pain are matching with those of a frozen shoulder, get alarmed that it may not be a normal shoulder pain and that you need to start with the treatment as early as you can. Now, as usual there are many drugs to heal frozen shoulder but some of them like painkillers, steroids are not at all good for your health in general. I mean you can use them to get temporary benefits when your pain is at the peak but you cannot consider them to be long term remedies. You need to go for safe remedies with less side effects and for that, the natural remedies are the best alternatives. These are basically quite easy and cost-effective ways to treat frozen shoulder and most of the remedies can be applied at home. 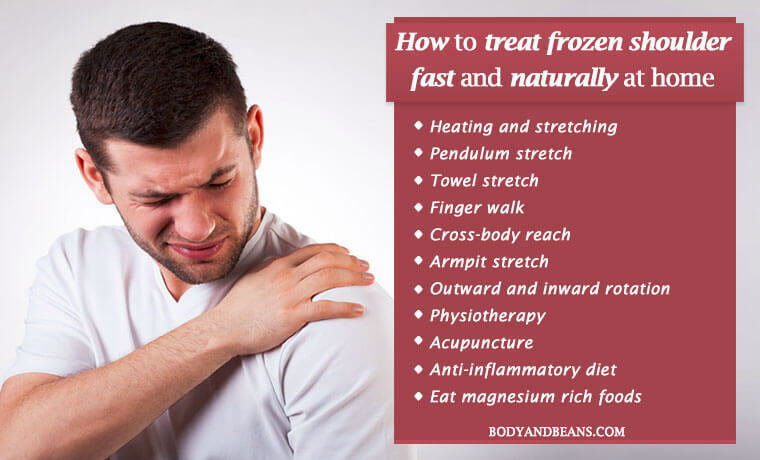 I have already shared a few of the best and easiest remedies to treat frozen shoulder naturally that you may like to try. I would specially like to stress upon doing heat treatment and shoulder exercises because these are really very beneficial in treating frozen shoulder. Initially you may consider taking an expert’s help to avoid you doing wrong steps and worsening your shoulder condition. Then once you learn the steps well, you can do it on your own. However, remember one thing that the problem of frozen shoulder is not something that you can get rid of overnight. So, patience is the key in getting rid of frozen shoulder. Try some of these remedies diligently and you will get the results in due course of time. Finally, if you have any other suggestion or know any other natural way to treat frozen shoulder, then feel free to share with us. And if you have already tried any of these remedies to treat frozen shoulder then let me know which one worked best for you. Lastly, if you find my posts valuable, please keep supporting us by liking, commenting and sharing the posts with others. Until then, stay fit, stay happy.